Picked this little fishin rig up for a song.....And its kinda cool fishin out of a classic old boat.....gets alot of attention at the ramp.....The old 1966 Evinrude sounds like new. It runs very shallow and with the outboard raised up you can troll around in a foot of water without any problem. 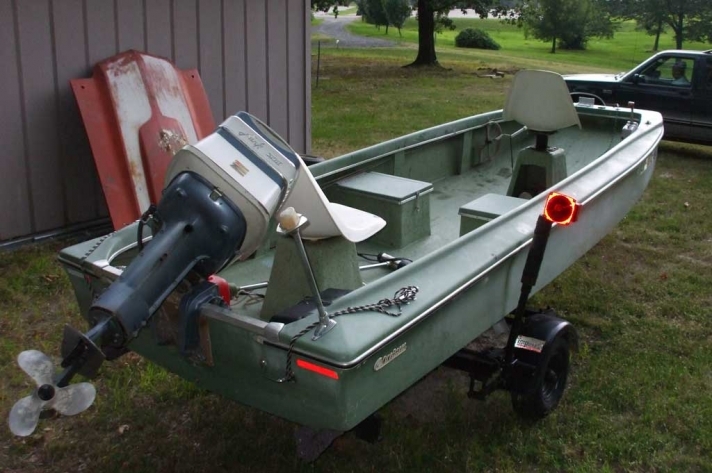 This boat is great for crappie fishing but also works well for bass fishing even though it doesn't have a raised casting deck. Its a bit too narrow for my liking....i'm 6ft tall and when swiveling the seats my knees almost touch the sides.......It has the old style "Jim stick" steering.....and push button transmission which can be awkard to use....specially when trying to trailer the boat in rough water......No built in livewell......Hard to find parts for old outboards.